We want to make it easy for pizza fans to get their hands on the food they love the most. Ambitious, excited and focused. That’s how Godfather’s Pizza, Inc. (GPI) Vice President of Development Dave Gartlan describes the next nine months for franchisee, TA Operating. The Ohio-based company, operating a convenience store brand under the name Minit Mart, plans to add 40 new stores this year around Kansas City, Missouri; Lexington, Kentucky; and across the state of Illinois. This will more than double their convenience store locations serving A Pizza You Can’t Refuse® from 38 to 78. Minit Mart stores with Godfather’s Pizza Express can already be found in Indiana, Missouri, Kentucky and Tennessee. Earlier this year, TA Operating opened four limited-service stores with Godfather’s Pizza Express in the St. Joseph/Kansas City area. Typical construction and implementation takes approximately 90 days to complete. It may be an ambitious goal, but one that has been met with excitement and much preparation. Godfather’s Pizza has been making pizzas for over 43 years and was recognized by consumers as the top choice for pizza, according to Nation’s Restaurant News. TA Operating is no stranger to the convenience store and pizza industry. Their partnership with Godfather’s Pizza, Inc. began in 2013 in Kentucky. One-of-a-kind signature specialty pizzas like the Taco Pie, Classic Combo and Humble Pie are available from the Express location by the slice or as Larges. Combo meals, as well as Cheesesticks, Breakfast Pizza, Pepperoni Rolls, Dessert Pizzas, and Chicken Wings can be also be added to any order or purchased ala carte. 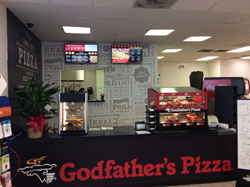 Learn more about franchising opportunities with Godfather’s Pizza by contacting Dave Gartlan, Director of Franchise Development, at DGartlan(at)Godfathers(dot)com, visiting Godfathers.com/Franchising, or calling 800-456-8347.